Someone even printed it on a t-shirt! A big thank you to everyone who stopped by this week, left comments and reveled in my newly clean and organized fridge. Because this is The Fulfillment Project I need to assess how the refrigerator helps push me in the right direction. 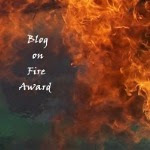 What does it do to make my pretty, darn good life, a little bit better? 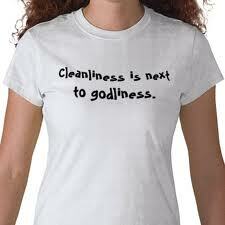 While I'm not particularly religious, I've often heard the phrase, "Cleanliness is next to Godliness." My interpretation of that phrase is, we all have a basic human need to be clean. We also have a basic need to eat. There's something soothing (dare I say fulfilling?) about the two needs being met in an unlikely spot like the refrigerator. Is there a point when my efforts to keep the refrigerator organized will outweigh the pleasing effect of having it perfectly organized? So far, keeping in mind I'm only five days in, it seems sustainable. Mostly because Rachel and I gave a lot of thought to how my family lives and organized the refrigerator around our lifestyle. My son likes syrup on his pancakes. But when he pours it, the syrup drips down the side of the bottle and leaves a sticky mess on the bottom which results in sticky refrigerator messes. Solution, put a folded up paper towel underneath the bottle (which is now always put back in the same place). When the towel gets messy, replace it. Similarly, all the clear boxes contain food grime to a limited sphere. If my cheese box gets disgusting, all I have to do is pull out the box, stick it in the dishwasher and I'm good to go. And truthfully, I'm much more likely to go the dishwasher option than I am to go the full refrigerator clean out option. The second piece I looked at was the affordability issue. What's the price tag on all those clear boxes? All told, they were just under the $50 mark at Storables. My guess is it will take me about two months to recoup that $50. Here's why. The newly organized refrigerator is visual. I can take a quick glance inside and see whether I'm running low on eggs, fruit, veggies or milk. At the grocery story that translates to more targeted purchases. I have a feeling I won't be buying extra packages of cream cheese, bunches of grapes or mustard anymore. Hopefully, the new system will help eliminate a lot of the slimy food waste which is synonomous (in my mind) with careless money waste. Eliminating careless money waste goes a long way towards making me feel more fulfilled. It's also a huge incentive for my husband to respect the food zones and not undo my organizational work. It all plays into the goal of making our pretty good lives, slightly better. Guess what's for dinner tonight? Leftovers! Because I can see them and I know exactly how much I have. Guess what else? It honestly makes me happy to know that food won't go to waste and I didn't over-buy yesterday at the grocery store. Next week, The Fulfillment Project searches for ways to deal with those itty bitty, teeny tiny annoyances that don't quite rise to the level of a full grievance. I know what mine are, and I'm putting a plan into place as of today. The problems, plan and results will be discussed and analyzed to see whether they meet The Fulfillment Project's goals. (that is in response to the Cleanliness is next to Godliness quote)--your FRIDGE, on the other hand, is cool... you haven't so much made it obnoxiously orderly as more user friendly. User friendly I can live with. and I LOVE the idea of saving money and wasting less--those are things that would make ME happy, too. I am soooo doing this to my fridge! Now all I need is a paddle to beat my husband and BIL with if they don't keep it that way. LOL! I think that cleanliness refers to the inside of us. At least, I'm banking on it! Good to you on getting the fridge organized. As much of a chore that that can be, I do like a nice neat fridge. It's so worth it as far as saving cash goes, when buying food that has been shoved and hidden in the back of the fridge. It's hard to maintain it with the children though...lol. Hart-I knew I was stretching that metaphor a bit! Mariebop-I'm so excited that you're going to do it. I want to see pictures!! Alex, I'm sure that's what the reference means. Naida, squee!! Thanks so much! !